Throwing a cast net takes years to master, but only minutes to learn. 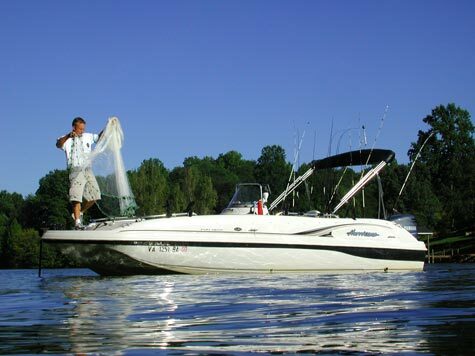 If you're interested in learning to throw a cast net, please tell me before our charter, so that I can plan for this. We can practice throwing at the end of a morning or the beginning of an evening charter. Here's a quick video of how to throw a cast net. I'll be adding some videos here very soon. I'll try and put several videos from different angles, but I just wanted to put a test video up for throwing a cast net. I like to throw 10 and 12 foot Calusa Cracker cast nets (20 and 24 feet in diameter) But I recommend starting out with nothing higher than an 8 footer. 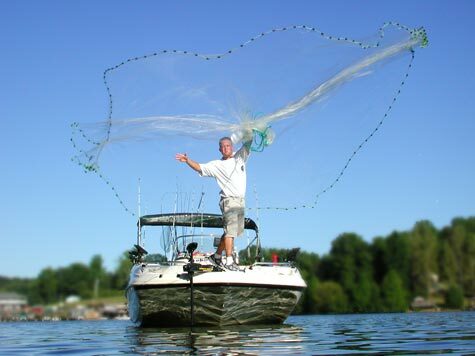 Cast nets come in different mesh sizes and here's what you'll need for striper baits in freshwater. For catching alewives off a dock under a light, you'll just need a cheapo 6-8 foot cast net with a mesh size of 1/4 inch. For catching gizzards in the coves and creeks, I recommend getting the longest net that you can throw with a mesh size of 3/8"-1/2". Also try to get the heaviest lb per foot of lead. A good all-around net for alewives and gizzards would be an 8 foot 3/8" mesh. 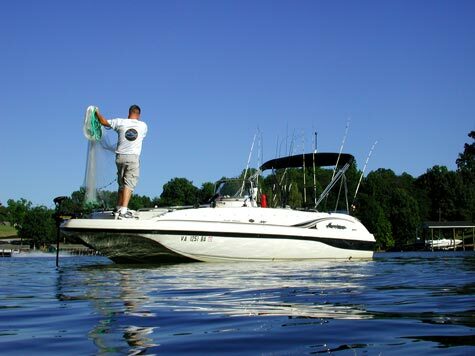 This net won't tire you out, and it will allow for getting some gizzards while not gill-netting alot of smaller bait. 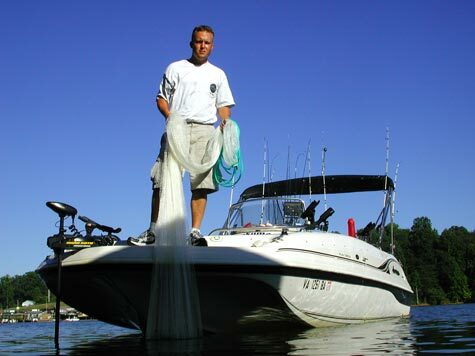 The first and most important step is to properly gather and set up the cast net for your throw. I prefer to fold a 10 foot net over in half, and grab the net a little higher than hip-height. Swing the net as if you're throwing a frisbee and provide lift for the furthest portion of the leadline. After a couple of tries, it'll come naturally and you'll have all of the live bait you'll want. For manufacturers of cast nets there's a couple that I recommend. The best of the best without a doubt is Calusa and Calusa Cracker cast nets. Calusa is the highest quality, but pricey, and the Calusa Cracker is a lower priced version of the Calusa and it is an awesome net. I throw Crackers and will never go to a different cast net. If you're just learning to throw and don't know the bottoms of where you're throwing, I would recommend a cheapo net from your local tackle shop. A good cheap net is Ol' Salt cast nets from Betts. When you're ready to move up, I would recommend a Calusa Cracker over a Betts Super Pro. The Cracker will open easier and sink faster than a Betts Super Pro. 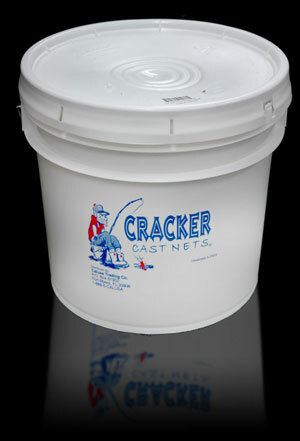 If you're looking to buy a Calusa Cracker net, try www.corefishingtackle.com. Core Fishing has all sizes of Calusa Cracker nets.